6.35: Alarm goes off, feel exhausted. bring the alarm into the bed and press repeat snooze 10 times. 7.20: pull the hot water bottle like dog out from under the duvet. 7.25: get up, open all the curtains. Let the dog out, make tea. 7.40: get dressed, jeans plus several layers of t-shirts and a jumper. 7.45: brush hair through, put on minimal make-up, mascara, blusher. 7.50: wake teen, tell him the time. leave light on outside in hall. 7.55: put a bowl of breakfast next to teen. bang around making unecessary noise. remind teen to wake up and eat. 8.05: hear breakfast eating noises. 8.10: quiet in room again. 8.15: tell teen I will be turning the car around. take bags and dog to the car. tell teen we have to leave at 8.20 to be on time. spends 5 minute spraying, guming and brushing hair. tie at a right angle. shirt hanging out at the back. machine, seen on you tube, and other apocolyptic type disasters. get shot down several times. agree not to talk as I am being too stressful. realize no one has cleaned their teeth. 9.00: Drive at a comfortable speed to where I walk the dog. 10.00: Arrive home, make coffee. things I can possibly do in the next 5 hours. Tidy up and do a blog post instead. Somehow, when children have left home and you are alone, this doesn't seem quite so bad! My 11yr old is sounding like your teen only younger. I too have had the wonder of brick in washing machine u tube video explained to me again and again....I still don't 'get it' apparently you have to be a teen or an 11yr old? Ha Ha ! I remember it all so well in my distant past and I agree if in doubt do a blog post! PS If you venture over to my 'Re-routed' blog there is an Award waiting for you if you are an Award accepting blog! You can find me through 'Where the Journey takes me' just click on the 'Re-routed' link in the sidebar. Beautifully written. Love this. And I do love your shot of your little table by the window. The perfect spot where to daydream and relax! That teen, I think I have a clone, except mine's now 20! Enjoy your alone times : they are so great to recharge!!!! HaHaHa!!! That's really so funny and what makes it hilarious is the fact that most mothers to teenagers can probably relate to your day!! Enjoy your recharge time at your window with a nice cuppa (If that was my corner, it would be my VEG-OUT corner for sure!! Ha ha. Me laughing at the realize no one has brushed teeth part.. Waiting for my 'teen' days..
What a great story about the teen... Here are two teens en one 9 year fellow. He doesn't matter when time is running. But I do..;) So whe have a sort off a 'fight' in the mornings. Phew - I need a sit down now! I am not sure if it is a 'good' thing or not but we all wake up pretty early in our house - we have never set an alarm and there is no clock in our bedroom. This morning I woke up at 4.45......15 year old daughter is always up at 6.30. The weekends are just the same.... Because of this we are able to pack a great deal into the day but one day I expect/hope that the early mornings stop because I am very, very tired! Brilliant post Heather! Your comments about your "teen" did make me laugh...uniform wrinkled but hair immaculate. It's always a rush in our house in the mornings. Every morning I vow to get up 15 minutes earlier but I never do. I thought it was already bad at age 9 - now I see what I have to look forward to! My 5-year-old won't get up before 9, without prodding. I wonder what she'll be like in 10 years! Love this today...I think every teen is the same! Waking us is so very hard for them. xoxo Happy weekend. Haahaa had to chuckle..teen very similar in this house especially the shooting down of vital info like parents evening and pe kit.DS (pre teen) on the other hand is up with the larks which can be just as stressful. Like my mum says "we spend 18 month telling them to stand up and talk for Mummy and 18 years telling them to sit down and shut up...." somethings never change. Enjoy your mornings. My teenage son is very strange in that he gets up in good time, has a bath, eats his breakfast and cleans his teeth, but then goes back to bed and invariably drops off back to sleep! I don't know why he doesn't just get up a bit later so that he hasn't got time to kill. I had to go and see what the brick in a washing machine was. Looks like the garden was being destroyed as well as the washer! hilarious!!!!!!! Not got to teenage troubles yet....my daughters have the other problem of me not wanting to get up! You had me in stitches! I'm still giggling about your teen and the morning routine! Thanks. 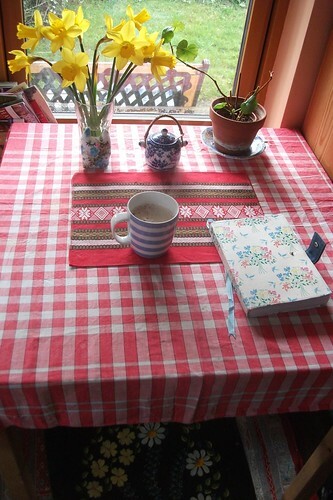 Loved the pic of your table with gingham cloth. It inspired me so much, I ran out to my kitchen - did a rearrange and even moved the table closer to the window. Luv it. Thanks again. You've made my day twice. Do keep blogging. Just found this. Made me laugh. Very Adrian Mole! Have female version of teen so look out for post inspired by yours! This rings a very loud bell! I remember my second son almost missing his bus to sixth form (he had his English Literature A level first thing that day) because straightening his hair was far more important!